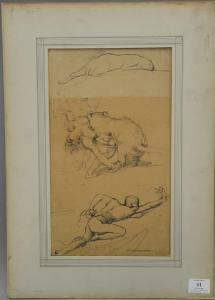 Find artworks, auction results, sale prices and pictures of Giulio Aristide Sartorio at auctions worldwide. GIULIO ARISTIDE SARTORIO (italian 1860-1932) "BRASILE" Signed, titled and dated 'G.A. Sartorio/MCMXXIV'  verso, oil on canvas laid down to board 22 1/2 x 30 in. (57.2 x 76.2cm) provenance: Private Collection, Massachusetts. 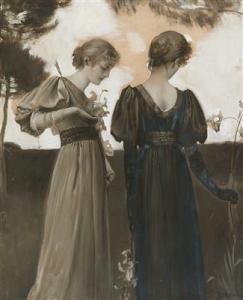 NOTE: Giulio Aristide Sartorio was born in Rome to a family of artists. After studying at the Institute of Fine Arts in Rome, Sartorio started to exhibit, entering a Symbolist painting into the Roman International Exposition in 1883, and winning the gold medal at the 1889 Exposition Universelle in Paris. He subsequently traveled to England, where he became familiar with the works of the British Pre-Raphaelites, including Dante Gabriel Rossetti (1828-1882) and Sir Edward Burne-Jones (1833-1898). These painters and their influence through both subject matter and style, were precursors to the Symbolist movement , which deeply impacted Sartorio, now best known as a Symbolist painter of both landscapes and fantasy motifs based on classic poems and legends. He was also an illustrator, teacher, writer, and a film producer, as well as director over the course of his career. The following lots illustrate Sartorio's pleasure (and keen ability) to paint landscapes, both with and without figurative elements. 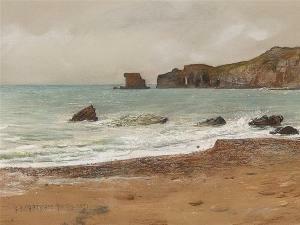 Highlighting nature and humanity in harmony, the artist depicts children playing on beaches, men hauling in bountiful nets full of fish, as well as jagged mountains juxtaposed with luminous trees. In each of these paintings, the viewer is presented with seemingly quotidian subject matter; however they are imbued with deeper meaning, and can be interpreted in a myriad of ways, true to the Symbolist philosophy. GIULIO ARISTIDE SARTORIO (Italian, 1860-1932) Ruins, Tiahuanaco, 1924 Oil on canvasboard 16 x 18 inches (40.6 x 45.7 cm) Signed, dated and inscribed by artist upper right: Bolivia, Tiahuanaco Lerovine, G. A. Sartorio MCM XXIV THE JEAN AND GRAHAM DEVOE WILLIFORD CHARITABLE TRUST Despite his passion for American painting, Graham Williford had catholic tastes in art which occasionally resulted in rather remarkable acquisitions outside the usual scope of his collection. This painting of the pre-Columbian ruins of Tiahuanaco in the Bolivian Andes by the Roman painter and film director Giulio Sartorio is one such acquisition. 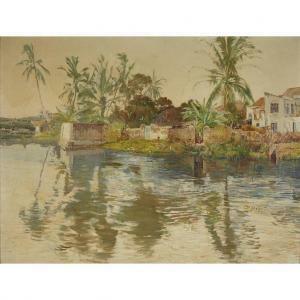 In the later phase of a celebrated artistic career as a Symbolist painter and friend of the English PreRaphaelites, as one of the finest late 19th-century painters of the Roman Campagna with its ancient ruins and friend of poet Gabriele D'Annunzio, and a prize-winning decorative painter, Sartorio explored the Middle East, Japan and Latin America during the 1920s. In Bolivia he was profoundly inspired by the Tiahuanaco ruins, the oldest sacred center of Andean region (an earlier name of the site was taypicala, meaning the 'rock in the center'). Traditionally it is thought to have been built by the predecessors of the Inca Civilization. Some of the massive structures at this site, like the Great Pyramid and the Sphinx in Egypt and Baalbek in Lebanon, date from pre-flood times, as long ago as 10,500 BC. Originally a coastal empire and now twelve miles from the coast of the sacred Lake of Titicaca, Tiahuanaco was the source of the creation myths, the social order, and the extraordinary preoccupation with astronomy that underwrote thousands of years of Andean culture. 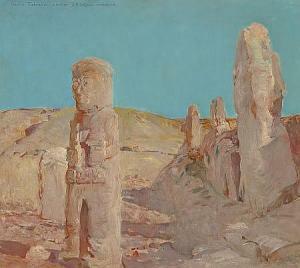 In the present work, Sartorio places in foreground of his composition the mysterious figurative Stela 8, and shows the ruins of the Kalasasaya temple off to the right.